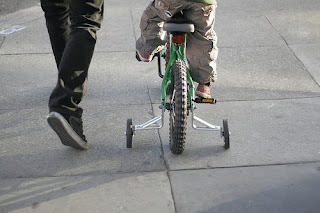 Rich Christian, Poor Christian: Have you even graduated to training wheels in your giving? In Monday's post on the 14 Major Components of a Healthy Financial Plan, I mentioned that charitable giving is important to a healthy financial plan. You know, money is a lot like the flow of water. Water that is in constant motion is typically clean, fresh, and healthy. The Dead Sea is a great example of what happens to water when its movement stops at one place. It becomes stagnant. Its life giving properties cease to exist. Money flows all around us each and every day. Money is important to our everyday existence. It provides us the means in order to live and work - food, shelter, clothing, and transportation. In today's financial system, many people (especially Christians) run into problems when they allow the flow of money into their lives but never allow any of it to flow back out. They become self-absorbed, self-centered, selfish, and greedy. Spiritually speaking, these people start to "stink." I recently heard a Generous Giving seminar in which the guest speaker spoke about the training wheels of giving. His claim was that tithing (10%) was just the beginning point of all giving. It's the training ground for us to become more mature in our attitude of generosity. I think this is a great analogy as we consider how we can become more generous in our giving back to God and others. Increase your tithe by 1% each year. Rick and Kay Warren have a great testimony in which early on in their marriage, they decided to step out on faith and increase their own personal giving 1% each year. So, even before the Warren's became millionaires through the popularity of his book The Purpose Driven Life, they were probably giving in the range of at least 35% of their income! In fact, Pastor Rick attributes God's blessing on his book to the fact that he and his wife have been generous givers. Reverse tithing. Reverse tithing is simply giving away 90% of your income and living on 10%. Obviously, it takes a certain amount of wealth and income in order to pull this off. For Rick and Kay Warren, once God had blessed them with millions of dollars in book sales, they purposed to maintain their standard of living and move to reverse tithing. What an awesome testimony! Special offerings. If your church asks you to consider giving to specific, stand alone, special offerings, ask the Lord what you should give. Capital Campaigns. Many churches will begin regular special offerings on top of regular budget/tithe giving in order to raise cash to begin a building project or pay off debt. These campaigns are a great way for God to stretch your faith and build up your giving muscles! Assets. The largest supply of untapped financial resources in our economy is held within our assets - retirement accounts, businesses, vehicles, houses, property, and so on. You can sell off these assets yourself and give the money, or use a service such as the iDonate Foundation, Inc.
Estate planning. You can leave the ultimate legacy of giving and Kingdom building by leaving large financial gifts to your church and other charities upon your death. Regular giving to the poor. Throughout God's Word, we find references to the poor and our duty as believers to take care of them through our financial gifts. On the spot giving. I've become a big fan of this type of giving. When someone stops you on the street for some money for food, give them some money or food. When charitable organizations are camped out in front of the grocery store on Saturday mornings, place a buck or two in the box. This can also be a great learning opportunity for your children. Take advantage of these simple moments. Time. Time has its own unique value that can be hoarded or given away. The old saying goes that "time is money," but you can't necessarily substitute one for the other. I think that many believers desire to give financially but think they can't due to an overextended lifestyle. They will turn to giving their time in place of money. You need to do both. Time can be given away to your church and other charitable organizations in which you believe in. Talents. Similar to time, talents hold value as well. God has blessed us all with natural talents and abilities that He wants us to give back to Him to build up the Kingdom of God. What talents and abilities do you possess that could be used for Kingdom purposes? Where are you right now? Have you even put on your giving training wheels, yet? Or, have you shed your training wheels and moved to a higher place in your giving?